Six Mixografia editions of 60 on handmade paper, 29 x 32 inches. The paper is white and thick enough to sustain a sharp impression at three or four levels, variably outlining parts of the picture. 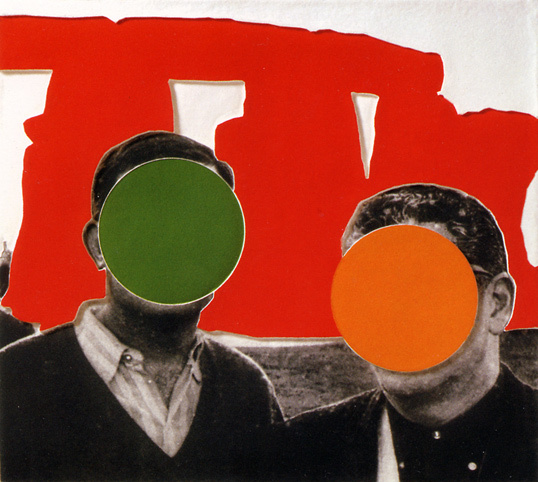 The silhouette of Stonehenge in red, yellow, blue, green, violet or orange fills the background (part or half of the monument, curving down to the right), against an unprinted sky, with a photographic landscape supporting it in black and white, and two photographic busts in the foreground, contemporary men, each with a disc of pure color obscuring his face. The printing is remarkably exact and fine, with a definite sculptural effect, and the photographic portions look like fine engraving.